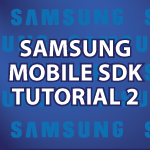 Welcome to part 2 of my Samsung Mobile SDK Tutorial! In this part I will completely finish explaining every line of code for our app. We’ll cover how to handle all the potential problems SsdkUnsupportedException can catch and we’ll handle each one. We’ll create custom alert dialogs. We’ll send the user to the app store to download an update and so much more. Most everything in this tutorial applies to any app you can make while also teaching about the Samsung Mobile SDK. I don’t know if you remember me, but you’ve helped me out with recursion in Java, and I appreciate it. I know that you have done tutorials on the C language and is very similar to C++, but I was hoping that you would be able to create a few tutorials for it as well. I also know you’re a busy man with creating many other video tutorials for other topics, and I (and probably others) am not in a big rush for tutorials in C++. However, it’ll be nice to see how games are programed in C++ and would like to see how you would program some simple games. I’ve already equipped myself with many C++, game coding, game engine, and related books and am ready to work my way through them. It would be nice to see other creative work developed by brilliant people such as yourself. I hope this works out for you after you’ve completed your other recent helpful video tutorials such as this one! Yes I remember you. I plan to finish the C tutorial soon. I’ll then probably run a C++ tutorial at the same time I continue making Android tutorials. I’ll devote about 6 months to making Android tutorials. I see so many opportunities in Android app development so I’m dedicating a lot of time to teaching it. I may reboot the Android tutorial actually and teach in a new way because I’ve learned a lot about what people struggle with since I started this. i have singed up for samsung sdk derek…. Hi, Derek I just signed up for the Samsung developer account. I love your tutorials !!! I realy would like to win this awesome smartphone. You are the Best Teacher ever 😀 . How to generate random Questions from database? contactList = AllContacts.get(getActivity()).getContactList(), my question is why do we have to use ‘getActivity()’ in this statement? How to generate random questions from database??? pls help make a tutorial…. Have every question have an identification number. Use a random number generator to pick one. please give a small algortihm snippet on it . yeahh got this.Can you please make a Tutorial on it. Thanks for your great tutorials but do you have a tutorial where you make a menu for a game with settings credits etc.? Hi Steve, I have 3 videos waiting to be approved by Samsung. They cover how to make a ListActivity and then call other classes from it. It is pretty much exactly what you asked for. It will be out in the next few days. Hi, I signed up for a samsung developers acount. Do all your Samsung related Videos need a aproval of Samsung? and have they ever turned one of your videos down? Hi Paul, Yes they are all approved by Samsung. No they have never turned down anything I sent to them. I was only supposed to do 4 videos originally, but I wanted to cover everything I found interesting in the Samsung Mobile SDK.